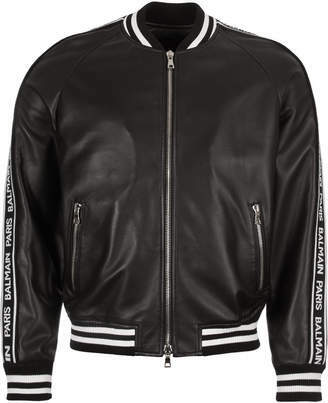 Balmain Leather Bomber Jacket in Black. Inspired by the classic varsity jacket, Balmain update the style into a modern, luxurious new form. Crafted from a supple lambskin leather, the jacket boasts a two way zip, striped ribbing to the collar, cuffs and hem, and is finished with branded jacquard ribbon to the sleeves.